Just another Friday night after a working week, exhausted brain, stuffed heart. Shivering on the back seat of friend’s motorbike, I said to myself: Hold on just a little bit more and you will be in Jiang Jin Jiu. 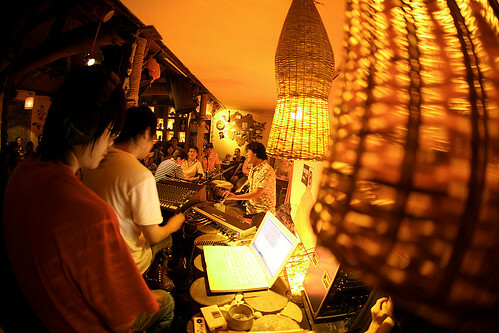 Jiang Jin Jiu is a tiny bar under a line of old trees between Beijing’s Drum and Bell Towers. A Xinjiang-style bar, though it hasn’t got the slightest connection with lamb chop barbeques! As long as there is a human presence in Beijing, there will be folk bands playing at Jiang Jin Jiu. I really want to call it my second home but I am only a curious and eager newcomer, a Mongolian folk band gig activist!… a gigavist! At the door-step of Jiang Jin Jiu, I take a glimpse of the bulletin board. The man who runs the bar tells me that the vocalist from the band Buyi is recording his solo, unplugged, here tonight. He points with his nose towards the stage, where I can see a man sitting comfortably in front of a microphone on the tiny stage. His face looks weather-beaten and he slightly resembles a migrant worker. “Hey, Hey … ” These two words uttered for an audio test carry a thick northwest accent. Staring at the microphone, the singer sits quietly, scratching his scalp and his back from time to time. And then a soft stroke of the guitar strings. No flirty chat-ups, his mouth is relaxed, waiting. I order a B-52 (a shooter laced with coffee liqueur, Baileys Irish Cream and Grand Marnier). Before the drink slips south, the house is filled with people. Chinese, Japanese… and a contingent of Occidents… all squeezed into the cosy venue in the lead-up to the performance. The room’s dark brown tones provide the backdrop and there is a warm feeling in the bar. Sporadic laughter is like a sprinkling of dope that fills the air. On the south wall, a large, hand-painted travel map of Xinjiang hangs down: hard, old thick paper with curled, knarred edges. Pictures are randomly stuck on the map marking moments of shared fun. Some are faded with tell-tale booze stains. I animatedly describe the lively birthday night I spent here to my friend … The warmth of Jiang Jin Jiu again breaking the ice that envelopes the heart. The man in front of the microphone flips the guitar strings, and the room begins to quieten down. “Our society does not need those little heartbreaks”, he announces with the guitar in his arms, like a wide boy. “Let’s have this ‘Endless Wine’!” he says, brushing the guitar and starting the song. Heat soars in the room. Once: When was the band founded? Wu: The band was formed in 1995. Once: Could you play music before that? Wu: No, we set up the band first, and then started to learn musical instruments. Wu: At the beginning we were all very much in love (with rock music), so we said: “Let’s create a band!” We then said: “Alright, you are the guitarist, you are the bass. Then you go and buy a bass, you go and buy a guitar… You go and buy a set of drums”. That’s how we did it. Then we searched for instructors and learned, which didn’t quite work. Someone said: “’Let’s go and learn in Beijing!”, so we came to Beijing and have been here ever since. Once: This costs a lot of money, doesn’t it? Wu: At that time, I swindled 10,000 yuan from my mother, you know? I said to my mom: “Mom, erm … give me the money you saved for my wedding. When I get married, I won’t cost you a single penny. In addition to that, you invest this money in me and I will be a superstar next year. Annual income 1 million yuan, I can get you whatever you want.” My mother believed in me and gave me 10,000 yuan. I was really excited, rushed into the musical instrument store, bought the best of everything immediately. Once: What was the goal then? Wu: The goal was simply to become famous immediately, and to become popular all over China as soon as possible. Now, 13 years later I am still sitting here, still an ordinary person. From the earliest time when the band set up to now, the only member who hasn’t changed is me. There must have been dozens of band members. They’ve come and gone. Once: That’s a bit sad. Wu: No, it’s not sad, it’s just losing money, but not sad. The coolest thing about us is that we are not afraid to play, and we are not afraid to lose. It does not matter. Once: That’s on your mother’s money. Wu: Those losses have already happened, what can I do? Cry? “Mom, I have failed you!” It does not help. Just earn it back next time, that’s it! That is the spirit of Buyi. Once: Ever performed in other countries? Wu: Japan, only been to Japan. Once: How was the audience’s reaction? Wu: They were, a bit … confused. At that time, our performance wasn’t so good. It wasn’t that mature then. What is mature? What’s immature? Talking about the feeling of immature, take an example! After you get married, you have a particularly critical mother-in-law, right? Everyday, this mother-in-law finds you unpleasant to her eyes. And you are particularly fearful, so everyday you struggle to make yourself pleasing to her eyes, according to her will: Do this, do that. The more you do so… the more she finds you unpleasant to her eyes. Wu: It’s immature. A sign of maturity is that now you’ve grown up, you are equal with her, or you use a grander and more inclusive feeling to embrace your mother-in-law. OK, you are picking on me, no problem. She says whatever she says, and you mind your own business. When you need to serve her well, you serve her well through your own choice. You are very capable of making choices, this is selective and it means that you know how to play this game. You have accepted the fact that there will always be a conflict between you and your mother-in-law. Accept this fact with a grander feeling. Then you have gone past it. But at that time, we could not pass it. We got stuck at this point and could not pass it. We constantly endeavoured. It just wouldn’t work, even if you endeavour for a lifetime, it only gets worse. Some day, you grow up and become more and more mature, and people will begin to say “aha” and will begin to respect you. Once: At that time, you were just constantly trying to meet the expectations of others, weren’t you? Wu: It’s not just that, it means that you go to a new place. This new environment has defeated you, and you cannot surpass it nor get over the defeat. In Osaka, people are especially calm when watching gigs. They just look at you like this. After you finish a song there is no reaction. The more you performed, the more timid you got, and constantly struggled to find out how to make them happy, then you were defeated. Once: When did you become mature? Wu: From our 13th year we began to understand the way of mature performances. Before that, we were in a total mist. We just knew, very vaguely that this is the direction, that we should go in this direction. Wu: There is a rough idea. For example, you know that your dream is at the other end of this Black Forest. You have to dive into this vast forest of darkness. After you are in it, you have no idea of the direction, the only thing you know is walking, to keep walking and to search for the way out, the right way, with pure intuition. You search on and on. Pah! You found the map, you know how to walk out of here! Then you begin your journey to the outside. Once: But what if you can not find the map, and cannot get out? Wu: It does not matter if you cannot walk out, we have already enjoyed it. It is dead if everyone must focus on the end result, that’s not courageous. We have a song called “The Far Away Land” which says that “your dream is in a very far away land, but you cannot reach in even in a lifetime.” What do you choose to do? To go for it or not to go for it? In fact, on the road, the feeling of being on the road is the most important thing in life, not the result of it. The warm sunshine, when will I taste it? 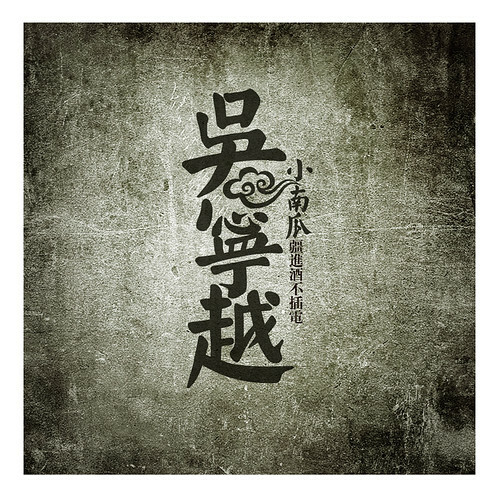 Buyi is a folk rock band from northwest China’s Ningxia Province. Now in its 13th year, the band has two albums: “That Long” and “Endless Wine (Live) “. They have also made the popular song “I Love You, My Dear Girl” for the movie “Crazy Stone”. 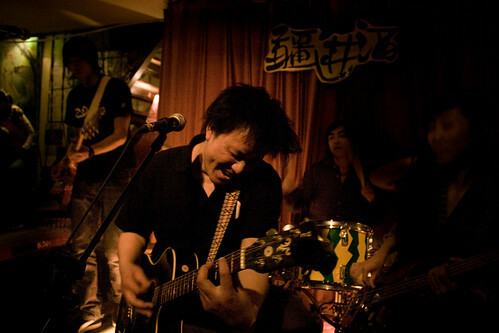 Wu Ningyue, 33, from Ningxia, is the band’s founder and vocalist. The name Buyi means cotton clothes, which translates as common people as opposed to the luxury of silk clothes. Senior Advertising Creative Director: Beijing’s most loved photographer from the city’s underground music scene and skilled at capturing and presenting heated moments from live gigs.